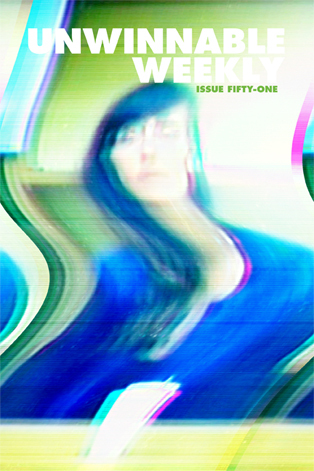 The following is a reprint from Unwinnable Weekly Issue Fifty-One. If you enjoy what you read, please consider purchasing the issue or subscribing. When I came across David Carlton’s blistering rebuttal of critics of the Shenmue III Kickster via this week’s Critical Distance, I had no expectation that my essay, “Bad Penny,” would merit inclusion. These days, there seem to be so many little internets competing for space in the conversation, I wonder that there is any conversation at all. To my surprise, though, “Bad Penny” did catch David’s attention, and he saved his sharpest rhetorical points for me. Holy cow, did he take me down a peg. Don’t get me wrong, I disagree with the bulk of what David lays out, but I find it incredibly valuable to do so. The act of pushing back refines my opinions in a way I am rarely afforded. David’s words are strong, but they are also well-reasoned. I bet if we sat across from each other, we could make a stirring debate out of it and really get listeners to think about the subject (and maybe we should!). I’ve always held that no one argument was inherently correct. There is infinite nuance in any given disagreement and I reevaluate my positions frequently. My job as a writer isn’t to be right – it is to give you, the reader, something to think about. I reckon I accomplished that with David. He certainly did with me. I asked his permission to reprint his dissent of “Bad Penny” and he graciously agreed (you can read it in its entirely on David’s blog, Malvasia Bianca). It has been edited slightly from the original. If all goes well, he will also have a follow up in a future issue. Perhaps between the two of us, we’ll have give you something to think about, too. 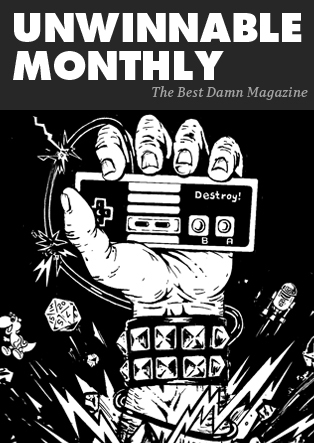 I also saw retweets of a bunch of tweets from Stu Horvath on the topic; he then put his thoughts together in an article in Issue 49 of Unwinnable Weekly. I thought that Paprocki was being paternalistic, but Paprocki had nothing on Horvath: Horvath says, “Think of me as the person trying to shake you awake,” to which my first reaction is that the word “sheeple” must have been deleted from an earlier draft of his article. It is a kind of religiosity. Talking to Violet, I felt like we were living in a time of prophecy, that any deviation from orthodoxy might derail the Third Coming of Shenmue. It didn’t matter that maybe people were getting conned into paying upwards of $10,000 to pre-order a game that would eventually cost, at most, $60 retail. He accuses other people of treating this as a matter of religion but he’s the prophet who is trying to shake us awake. And that last sentence is, to my mind, a glorious combination of paternalism and factual incorrectness. He says “upwards of $10,000,” but in fact $10,000 is the highest tier, so I have no idea who is supposed to be paying more than that; and there is a cap of 23 people who have access to tiers more than $500. Right now, the game has 42,402 backers; of them, 24,895 are at the $29 tier. So, yeah, let’s assume that game will cost $60 at retail; that means approximately 60 percent of the backers are choosing to get the game at half-price, and while about 30 percent of the backers are paying more than $60, those backers are getting stuff beyond just the game. Maybe I’m a bad person because I bought an Okami art book or a Katamari Damacy soundtrack, maybe the people I see on twitter who buy figurines for their favorite anime are horribly misguided, but I don’t see why; and I don’t see why I should treat people making similar choices about Shenmue as victims of a con that need to be shaken awake. All three articles seem particularly disturbed by the $10,000 reward tier. (Though at least the other two articles don’t hallucinate higher tiers!) And, of course, there’s no way in hell that I’m going to spend $10,000 for the rewards at that level. But, seriously: there are 42,204 people who have signed up for that Kickstarter. Four of those people have decided that spending $10,000 was a reasonable choice for them. We’re not talking the 1 percent here: we’re talking the .01 percent, one out of every 10,000 people who backed the Kickstarter. I doubt that the income distribution of Shenmue Kickstarter backers mirrors the income distribution of the US as a whole, but if you’re in the top .01 percent of US income, then you’re making 27 million dollars a year; if I were making that kind of money, then, honestly, maybe I would be totally happy to spend one-two-thousandth of my annual income on Ryo’s jacket! Really, the percentage of people affected is so small that we’re talking about La La Land. And I’d also like to know where the financial dividing line is beyond which Horvath will decree that people are getting conned. Was I getting conned by spending money to go to GDC? Was my family getting conned by the money we spent on our last family vacation? Are we getting conned by the tuition prices that we’ll spend to send our daughter to college? (Actually, I can answer that third one myself: yes.) Please, tell me the appropriate level, so I can make sure not to slide into religious orthodoxy! It is a free market, of course, and Kickstarter has a vested interest in lucrative, headline-generating campaigns. The Kickstarter I prefer, though, is the one before the Double Fine Adventure Kickstarter, a place for creators to fund projects that would otherwise be impossible in conventional markets. There wasn’t anything inherently wrong with the Double Fine campaign, but it started us down a long road that inevitably leads to campaigns like Zach Braff’s movie (which later got Hollywood financing) and Shenmue III. He could just as easily have said: the Kickstarter he prefers is the Kickstarter that got Unwinnable Weekly funded. And I like that Kickstarter too – all eye-rolling at this article aside, I’m really glad that I backed Unwinnable Weekly! But small-project Kickstarter is still around: just to make sure, I looked again at my list of backed projects, and there’s a whole mixture of stuff there, with weird one-off stuff next to established small publishers next to, well, Shenmue. Maybe there’s some sort of apocalypse coming where all the small and medium stuff will disappear, but I don’t see evidence for that. And as to “religiosity,” “prophecy” and warnings about “deviation from orthodoxy”: yes, I do see that, but where I see that is in an article that talks about “something terrible happening,” “getting exponentially worse,” that “will destroy the industry”. 1. I promise, I have never typed the word “sheeple” in any kind of seriousness. 2. When I said “upwards of $10,000” I was referring to the ability for a backer to raise their contribution above the set values for award tiers. However, I recall now that $10,000 is upper cap for any Kickstarter donation. They just don’t get higher than that. So in this, I was definitely in error. David Carlton is a programmer and ex-mathematician with an excessive fondness for music games and Netrunner. He’s a former contributor to Critical Distance and cofounded the Vintage Game Club. You can read his blog at Malvasia Bianca, or follow him on Twitter @davidcarlton.